Brad Harris and Alan Steel star in a rather generic but watchable Peplum from director Gianfranco Parolini. RHV Italy R0 DVD. Sansone is, basically a walking, talking peplum cliché, your typical story of a strong hero finding himself in the court of an evil monarch - refusing to help them, getting locked up and eventually helping to overthrow them - ultimately there doesn't seem to be an original idea in the whole production. Not that this alone makes the film bad, it is rather the the listless pacing, insepid "comic relief" and general lack of direction that makes the film distinctly slow and uninteresting - even climax is the rather predictable and unexciting, doing nothing to alleviate the problems. Fortunately there are a few enjoyable action scenes that at least make the film watchable. The use of the biblical Samson character is never really explained, although he does pull down a few columns. Director Gianfranco Parolini, who would go on to make some of the most entertaining Spaghetti Westerns, does nothing more than a routine job here, directing the film with no particular flair at all and doing nothing to lift it out of the cliché. The production is generally solid, with some good sets and impressively big casts of extras. The music is, like the direction, servicable but generally unspectacular. In his second muscleman role, the American import Brad Harris certainly looks the part as Samsone and manages to act pretty well. He plays alongside the musclebound Italian Alan Steel (Sergio Ciani), one of the genre's few home-born stars who would go on to star in a number of the later Pepla, here in his first major role. 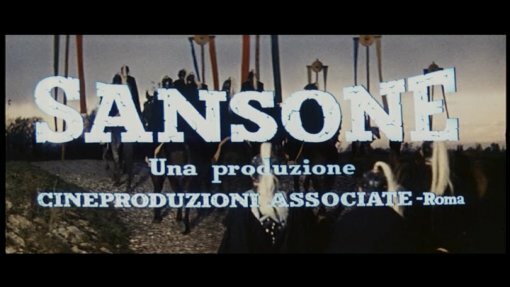 A rather tedious film at times, Sansone has a few redeeming factors (the action scenes are quite enjoyable) and should prove of interest to genre fans, but certainly not a film for newcomers. Not recommended. Anyone famous in it? Brad Harris - an American actor who went on to star in several Spaghetti Westerns, including Django... Adios! Alan Steel - one of the few Italian muscle-man stars who also went on to star in The Fury of Hercules with Harris. Directed by anyone	interesting? Gianfranco Parolini - Italian director responsible for the very enjoyable Sabata series of Spaghetti Westerns and also directed the Euro-War film Five for Hell (1969). Any gore or violence ? Lots of fighting, nothing bloody. Who is it for? For Peplum fans only, one of the genre's lesser entries. Generally very good looking print - strong colours and no print damage. Audio English mono - sounds generally good. Italian mono - okay, but with some noticable hiss throughout. Interview with director Gianfranco Parolini - a very animated discussion with the director about Sansone, Goliath contro i Giganti and some of his other films. Includes clips from the first two and some very interesting stories. In Italian, with English subtitles. (17 minutes) - same as included on RHV's Goliath Contro i Giganti DVD. The DVD case has an insert with some crew notes, and a brief Samson filmography. In Italian. Other regions? Available in the US from Alpha on a very low quality fullscreen print, also on DVD in Germany from E-M-S under the title Herkules im Netz der Cleopatra with an anamorphic, OAR print, and an interview with Brad Harris, but all in German only. Cuts? The film is believed to be fully uncut. The print used is Italian language. A rather unimpressive and routine Peplum, although it is watchable and has some decent action scenes. A very good looking and sounding print, with an interesting interview - pity it could not have been for a better film! All text in this review written by Timothy Young - 13th October 2007.